"1867 was a glorious combining of man's vision and energy, and practical common sense," says Prime Minister Lester B. Pearson, with great admiration in his voice. 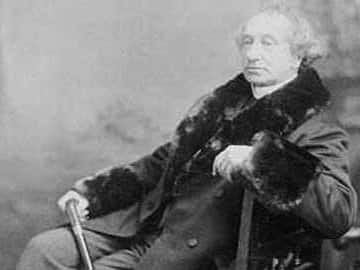 It's Jan. 11, 1967 - the 152nd anniversary of John A. Macdonald's birthday. At the celebration ceremony in Kingston, Ont., Pearson is speaking about Macdonald's importance to Canada's history. In this excerpt from his speech, Pearson praises Macdonald for his leading role in Confederation, the union that created the Dominion of Canada in 1867. • After toiling in local politics in Kingston for several years, the Conservative Macdonald was elected to the legislature of the Province of Canada in 1844. (Upper and Lower Canada, also known as Ontario and Quebec, had already been united as the Province of Canada in 1840.) In 1856, Macdonald became the joint premier of Upper Canada, representing the Ontario side. Over the next few years, his co-premiers on the Quebec side would include Étienne-Paschal Taché and George-Étienne Cartier. • Macdonald is considered to be the leading "Father of Confederation," although most historians are quick to credit the other politicians he worked with on this endeavour as well. These include the Liberal party's George Brown (who was the main proponent of Confederation at first), Quebec's Cartier and Nova Scotia's Charles Tupper. • Macdonald was actually hesitant about the idea of Confederation at first. According to historian Michael Bliss in his 1994 book Right Honourable Men, "Right up until the last moment in 1864 he was not enthusiastic about creating a new country.Macdonald stood for the status quo until he realized change was upon him." As soon as Macdonald was convinced that this was the best way to go, however, "he climbed aboard the bandwagon, and soon led the band," explains Bliss. • The first conference discussing the union of the British North American provinces (Confederation) occurred in Charlottetown from Sept. 1 to 9, 1864. This conference was initiated and planned by the Maritime Provinces. • The politically important Charlottetown Conference had to share the spotlight with the first circus to visit P.E.I. in 20 years - a popular event that often garnered more attention than the political meetings at the time. • At the end of the Charlottetown Conference, it was decided that the idea of a British North American union had merit and warranted further discussion. So another meeting was planned for Quebec City in October of the same year. • There were 33 delegates attending the Quebec Conference. Quebec's Étienne-Paschal Taché was appointed chairman of the conference, but John A. Macdonald clearly emerged as the leader in the proceedings. Because he was trained as a lawyer and was better educated in constitutional law than many of his colleagues, Macdonald could act as the constitutional expert on the team engineering Confederation. • The next and final conference on the subject took place in London, England, from December 1866 to March 1867. It was here that the new Canadian constitution, the British North America Act, was drafted. • Confederation was made official on July 1, 1867. The four provinces joined by Confederation in 1867 were Ontario, Quebec, New Brunswick and Nova Scotia. • Because of his leading role in engineering Confederation, Macdonald was appointed prime minister of the new nation as of July 1, 1867, by the governor general, the Viscount Monck. An official election occurred a month later, which Macdonald won. • Also on July 1, 1867, Macdonald was knighted by Britain for his efforts in Confederation. • As a result of Confederation, Macdonald expected that provincial and local governments would eventually wither away, in favour of an all-powerful federal government. As explained in Michael Bliss's book Right Honourable Men, Macdonald privately told a colleague: "If Confederation goes on, you, if spared the ordinary age of man, will see both local Parliaments and Governments absorbed in the General Power. This is as plain to me as if I saw it accomplished now. Of course it does not do to adopt that point of view in discussing the subject in Lower Canada." • In 1870, Manitoba and the Northwest Territories became part of Confederation. British Columbia joined in 1871, P.E.I. joined in 1873 and Yukon became a territory of Confederation in 1898. In 1905, the recently created provinces of Saskatchewan and Alberta became part of Confederation. Newfoundland didn't join until 1949. Most recently, Nunavut entered Confederation in 1999. Prime Minister John A. Macdonald pleads his case for a far-reaching railway.